With the globalist elites gathering in Davos for their annual mutual masturbation propaganda-fest, there is a growing threat to their dominance led by former Trump strategist Steve Bannon that threatens to upset not just the centrist balance in Europe but fuel revolts worldside. As Bloomberg’s Joshua Green and Richard Bravo report, Steve Bannon had a front-row seat to see Belgium’s liberal-led government disintegrate last month after delivering a fiery, anti-migration speech to local lawmakers just hours earlier. President Donald Trump’s former adviser is now eying Spain as the next domino to fall in his drive to disrupt European integration. Belgium joins two other European Union members operating without a full government and at least six others that have recently undergone no-confidence votes. Many of them have fallen prey to anti-EU parties that used minority leverage in their national parliaments. In Spain, the nationalist group Vox had an unexpectedly strong regional showing last month and could help to unseat the Socialist government. “This populist-nationalist revolt is a worldwide phenomenon,’’ Bannon said in a Dec. 21 interview in his Washington home. “Belgium is the latest example of this,’’ he said, adding that Spain will be a “big focus” this year. 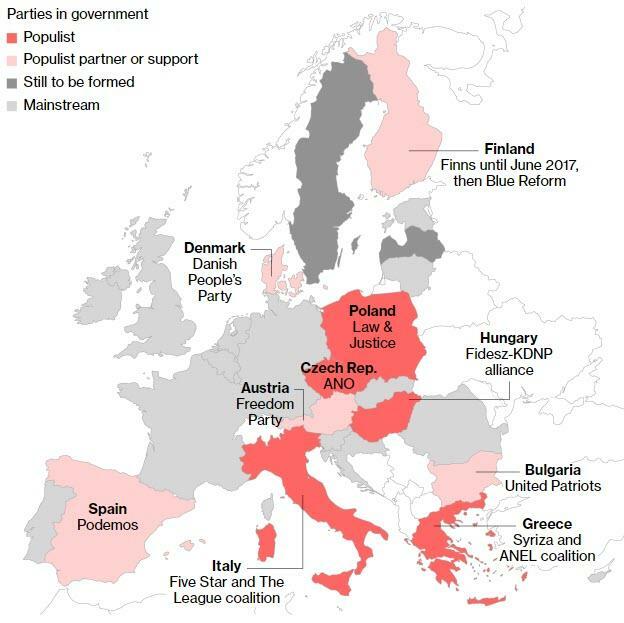 This year’s European Parliament elections come as populists, many of them euroskeptics, control or prop up 10 of the EU’s 28 member governments. Note: As of Jan. 8, 2019. Parties on both the left and right were defined as populist with the help of academic experts. Most, but not all, parties are also nationalist. The waning popularity of French President Emmanuel Macron and Chancellor Angela Merkel has raised doubts about a Franco-German reform push to further integrate the 28-nation EU. 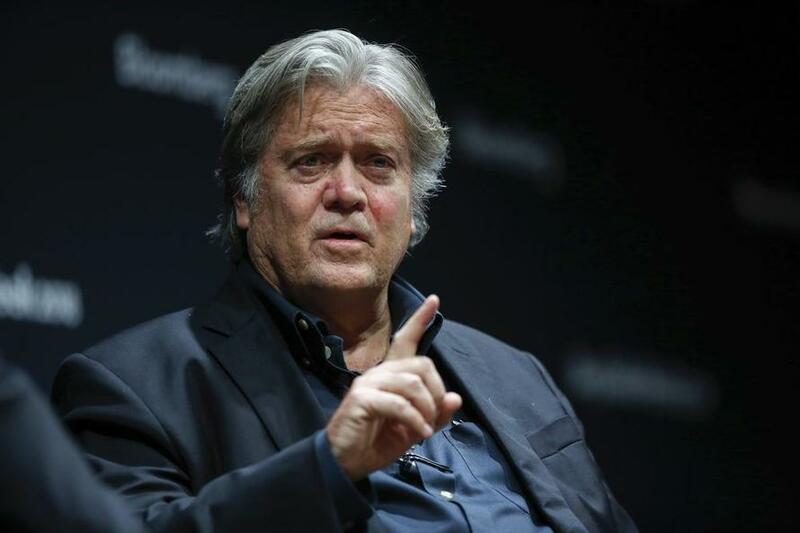 Bannon sees this as a prime opportunity to rally euroskeptic parties ahead of European Parliament elections in May, and carry out on a continent-wide level what’s already happening in some individual countries. “The energy is on the side of the populist-nationalist parties and the people who back them up,’’ Bannon said. Belgium’s fragile governing coalition fractured last month after Prime Minister Charles Michel’s administration lost the support of the right-wing New Flemish Alliance, which opposed Brussels’ support for a non-binding United Nations agreement on migration. This was the same UN pact that Bannon denounced in a speech to Flemish lawmakers — along with right-wing French firebrand Marine Le Pen and Czech politician Radim Fiala — the night the government faltered. The UN’s Global Compact on Migration committed signatories to increase cooperation on the international movement of peoples, and opposition, spearheaded by Trump, united populist and right-wing parties across the globe. Governments from Slovakia to Estonia and Chile faced backlashes over the accord, which the UN says neither encourages illegal immigration nor forces countries to change their admission policies. Bannon would like to use his Brussels-based group The Movement — a loose alliance of nationalist parties — to replicate this “command by negation” strategy in other countries and in the EU itself ahead of bloc-wide elections in May. Bannon doubts that these like-minded parties will be able to win a majority in the EU Parliament, but will aim to get at least a third of the seats as a means to block centrist momentum. “The leaders of this globalist movement in Europe are in decline,’’ Mischael Modrikamen, the founder of the Movement with Bannon and the leader of Belgium’s right-wing People’s Party, said in a Jan. 11 interview in his Brussels home. The strategy has already played out in Belgium. Sweden doesn’t have a government after the electoral gains by the nationalist Sweden Democrats, a party with neo-Nazi roots. Latvia’s traditionally center-right government has failed three times to create a coalition since populist parties increased their representation in October’s elections. And nationalist or populist parties are already in charge of the governments in Italy, Poland, the Czech Republic, Hungary and Greece. Spanish Prime Minister Pedro Sanchez took power in 2018 with support from the left-wing populists of Podemos but is now struggling to pass his budget and could be forced to call an early election this year.